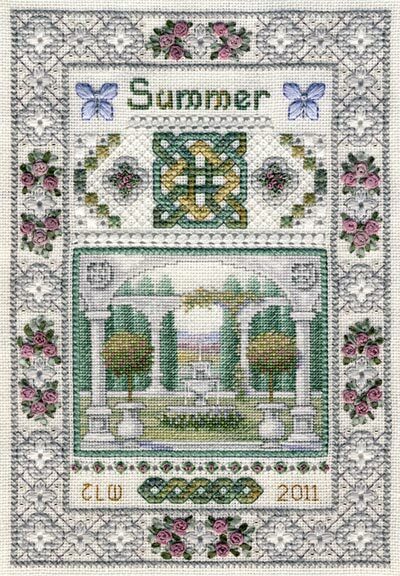 At long last, now that Winter is nearly upon us, Miniature Summer Sampler is finally finished! The design is available at PatternsOnLine.com only. I hope you’ll enjoy it! This entry was posted in Needlework, Uncategorized. Bookmark the permalink. Thanks for the heads up about the incorrect number on the Gloriana. How I can mess up something so simple is beyond me, but I always seem to manage! LOL I’ll make the correction as soon as I can. You raise a good question about designs not included on the website. I think only designs created specifically for classes and available only at those events are not listed. To be honest, I don’t know exactly how many there are…but there aren’t many. I really never thought of adding them to the website, but I guess I could… thanks for the suggestion. I’d love to see a list of the designs for classes that aren’t available elsewhere, too. And since I haven’t commented yet, just want to say that Summer Sampler is gorgeous! And looking forward to the “unknown designs list”. (hopefully). I’m working on it… it’s not a very long list… only 8 designs, as far as I can tell. I’m missing a couple images, so will have to dig out the models and scan them. Yay, new techniques to try! Lovely design (as always), already bought mine to keep the other seasons company :D.
And on a totally different subject: is there a list of the teaching designs and other rare designs that you made, preferably with pictures? Or will you make one on the website someday? The subject came up in a conversation recently and we were wondering how many unknown designs there are (i.e. not mentioned on your website) and what they looked liked. Just how many are there? Thanks so much, everyone… I’m very grateful for your kind words. It’s gorgeous, Teresa! At Stitcher’s Hideaway a few weeks ago, one of my classmates had Autumn completed for show & tell. It was absolutely stunning, and I think I may have to add the set to my to-do list now! How wonderful. Thanks for posting and where to buy it. It’s beautiful! The ribbon embroidery roses are the perfect touch. Thank you so much for sticking with it, Miniature Summer Sampler was well worth the wait! Can’t wait to add it to my collection. Such a beautiful sampler – full of air and freshness! Beautiful! Thank you for sharing your designs with us! Thank you, everyone. I’m glad you like it! I’m just sorry it took so long to finish the series… I truly appreciate your patience! It is beautiful, and well worth the wait. Thank you so much for finishing the series. Beautiful…I want to sit and look at that view!! It looks awesome Teresa! Thank you! The scene reminds me of English Garden Sampler – which I adore…and I love the roses!!! Awesome work! Teresa! It’s even better than I imagined or hoped! Thank you for all the effort you put into this, well worth the wait. Happy Anniversary too by the way! That’s gorgeous! I’ll put it on my wish list right now!